They’re both SNC-educated. They like to think about things. The inventories of their dorm-room furnishings in both cases include a basketball, a turntable. They make the most of their educational opportunities, and ascribe great value to them. They appreciate the changes they’ve seen on campus over the time they’ve known it. They’re both above-average height. And they have both, in different eras, fitted their tall frames happily into one of the smallest spaces on campus: Burke 215. One, a history and political science major, has the world at his feet and will graduate this year. The other is now a college president – president of this very institution, in fact. 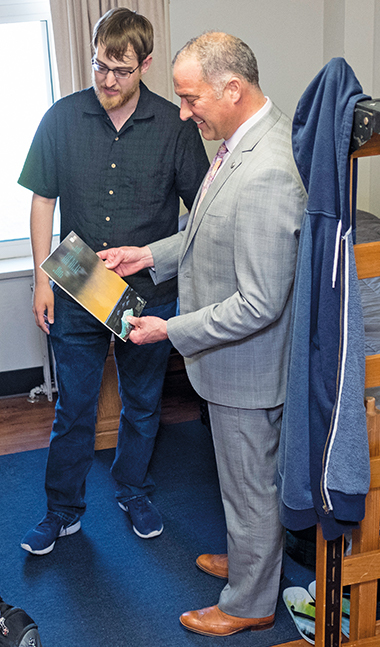 Mike Dauplaise ’84 sat down with Nicolas Schmudlach ’19 and Brian Bruess ’90 as student and president chatted about life on campus from their shared residential viewpoint. Schmudlach: I lived in Madelaine/Lorraine as a freshman and 3M as a sophomore. That was the river end of campus. Now I find that I’m on the south end of campus, and given my majors, I never go past GMS [Gehl-Mulva Science Center]. I remember when I toured here as a junior in high school, GMS was up but nothing was in it yet. Bruess: When I graduated, Cofrin Hall was not here, Bemis was not here, and of course the Mulva Library and the new residence halls were not here. Last summer, the Class of 1957 was here celebrating their 60th. Carol and I were talking to a table of people. [Bruess is married to Carol (Sessler) Bruess ’90, who also lived in Burke.] They were having trouble navigating on campus because of all the new buildings! I understand. Half of the meetings I’m going to I don’t know where they are. It’s kind of amazing! Schmudlach: The first two years I was rooming with people, and then last year I went to a single room in Burke 215. The room itself was small. It was kind of tough in the early going. When you have a roommate, they’re always there if you need something. I counteracted that by inviting people over to my room or going to their place to hang out. A single room is very nice because you don’t have to worry about rowdy roommates. If there’s a mess in the room, the mess is yours. There are pros and cons to both. Bruess: I chuckle when I hear you describe the room as small. I had a roommate when I lived in Burke 215. At the time, students could make their own lofts and we constructed a single loft across the top of the room that was no more than 16 inches from the ceiling. Underneath we had a small couch and a beanbag chair. We also had 4-foot-tall cabinet speakers for our stereo, and we didn’t have video games or computers. Burke didn’t have any lounges and we didn’t have a Campus Center then, so there was a lot more hanging out in the residence halls than there is today. It was common to see five or six people hanging out in the rooms and all sorts of chaos going on in the halls. Good memories! Schmudlach: This past year was the first year I had my turntable on campus. I got into vinyls because my friends collect. Half of my collection, bands like Asia, are part of my dad’s collection and I get good use out of it. I tend to lean toward heavier music when listening to CDs or digital, so having many of my vinyls fall into the easy-listening category provides a nice selection, especially for my guests. The misconception about introverts is they can’t do any social interaction. If you need to survive, you’re going to do social interaction. It’s part of how we’re wired. Bruess: I grew up more of an introvert, but I’ve watched my preferences evolve a bit. When you recharge, you’re doing it solo. For someone like you who’s really good at interacting with other people and can function well, you and I are what I call performance introverts. You can turn it on when you need to. Do you study much in your room? Schmudlach: No, I have established in my mind that my room is the hangout spot and the sleeping spot. I can’t do anything productive in my room. It’s a black hole of turn-off-the-brain! Bruess: Students have to find the space that works. I’m always curious about where that is. Schmudlach: I have an on-campus job in the library. It’s a great place to study, don’t get me wrong! But I actually go to the Pennings Room off the church atrium to study. I’ve gone in there maybe three dozen times and only had other people in there maybe three times. It’s super chill in there. Bruess: What are you excited about for your senior year? Schmudlach: I only have to take three classes for the last two semesters in order to finish both of my majors. I’m looking forward to getting more work experience. I’m working in the library, I’m working for athletics. I do the filming for volleyball and basketball. When you watch it on the computer, that’s usually me doing the camera work. Bruess: How aware are you that this is the most fun time of your life? Once you graduate, the pressures are different. Schmudlach: I’m aware of [that]. I’m just pushing it away and trying to keep it at bay for a while. It’s going to be interesting, but in a way I’m looking forward to it. Bruess: I think it’s really good that you’re holding off. I also think it’s important to fully immerse yourself in the college experience because it is so unique. It never happens again, even in grad school. It’s such a precious time. I love how thoughtful you are about your own experience and not taking it for granted and trying to get the most out of it. It’s really a model approach. 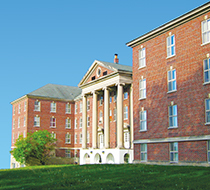 Dennis M. Burke Hall underwent a significant renovation in 2018 that converted most of its double-occupancy rooms to singles. The renovation project includes redecoration of its beloved colonial-style fireplace lounge, traditional home of the Wednesday-night Burke Hall Mass. A newly furnished lounge on the lower level provides another place for hanging out with friends. Burke, completed in 1942 in a classical style that makes it a true icon on campus, was first named Residence Hall and then (more imaginatively) Berne Hall. In 1979, it was renamed after the college’s second president.